With a calm tone of voice Riktor tells us about his life. How he prefers to sit on a bench in the park Mester where he can watch the other park visitors quietly. How he always have lived alone. How he feels as though a swarm of insects is in his head when the sun sets, and how he is haunted by a truck with a diesel motor that parks by his bed during the night. How he can see in the dark. How he works as a nurse at a skilled nursing facility where he is supposed to take care of the elderly that lives there, but that he instead amuses himself by tormenting the ones that cannot complain. How he puts the syringe in the mattress instead of the patient and pours the medicine in the sink. It is those kinds of things that makes him feel good. By chance Riktor makes contact with an alcoholic man, Arnfinn, who also spends time in the park. A strange relation forms and Riktor has found his first friend, even though the friendship is contingent on the fact that he buys Arnfinn a drink or ten. Riktor becomes very disappointed in Arnfinn one day and cannot keep his anger over his friend’s betrayal under control, which results in Arnfinn being buried in Riktor’s yard. I have a bitter taste in my mouth as I put it away. I am blown away. It feels like I have been trapped in a crazy person’s mind, and I hold my breath while Riktor calmly describes his horrific actions as if they were completely natural. The novel has a slow tempo, and Fossum takes the time to describe environments, thoughts and actions in great detail. 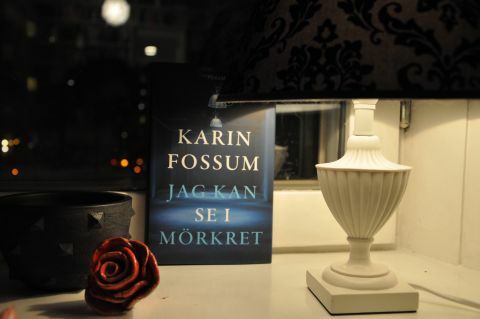 This was my first encounter with Karin Fossum, but definitely not the last.